Why Are Deer Being Smuggled into Texas? The sight of deer munching in suburban gardens is a common one across America, particularly in places like Texas' hill country, where at holiday time the ubiquitous roadside deer-warning signs are decorated with round red stickers by an anonymous artist in an homage to Rudolph, the most famous deer of all. So plentiful are the white-tailed deer in Texas that the notion of smuggling deer into the state seems absurd  yet this growing and lucrative illegal trade, with its threat of devastating disease, is challenging federal and state wildlife officers across the country. Nature can only provide so much. Deer breeders deliver bigger animals, prized by hunters, for luxurious game reserves (which then charge several thousands of dollars for a "hunting package"). Texas alone has 1,100 licensed breeders with approximately 87,000 deer and a total economic impact of $652 million, according to a 2007 Texas A&M study. Breeders often sell deer at livestock auctions, where the price for a good buck can reach five figures (occasionally a champion buck, just like a prize bull, can sell for half a million dollars). Deer-breeding is the fastest-growing industry in rural America, according to that A&M study. 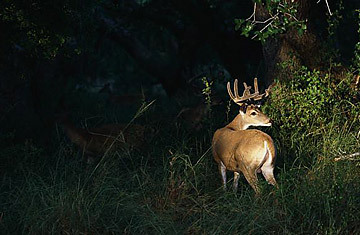 But the high prices have prompted some reserves to reject Texas-bred deer. And so deer are smuggled in from northern states like Minnesota, where the stock is bigger and smugglers offer cut-rate prices. This way, smugglers skirt Texas laws that have closed the borders to non-Texas-bred deer. It's not chauvinism at work. There is a danger that smuggled deer can carry diseases like chronic wasting disease  which is similar to mad cow disease  and bovine tuberculosis. The wasting disease has been reported in deer, moose and elk in 11 states and two Canadian provinces. Wisconsin has spent more than $30 million combating the disease, which threatens its lucrative hunting industry. In September, Michigan briefly closed 559 deer farms after an incidence of the disease was suspected. All farms were eventually cleared and reopened, and the state's $54-million deer-breeding industry breathed a sigh of relief. Texas is thus far free of the wasting disease and wants to stay that way. The threat, not only to animals on stock farms but also to those in the wild, is prompting Texas regulators to seek an increase in the penalty for smuggling from a misdemeanor to a felony, Williford says. Federal and state wildlife officials take smuggling cases seriously, but investigations take a long time to develop  a recent case was built over two years and then took 18 months to work its way through federal courts, where penalties are harsher. Minnesotan Brian Becker, who was already on probation for deer-smuggling in Oklahoma, was sentenced to 33 months in federal prison in November. Agents estimated that he had made at least $300,000 smuggling deer to one client in Texas. Houston businessman Robert Eichenaur was sentenced to 18 months in jail and hit with a $50,000 fine. Eichenaur was described by the Fort Worth Star-Telegram as the owner of a "posh hunting ranch" in the small east Texas town of Bedias. The ranch, Circle E, advertises exotic hunts and charges $12,000 or more for a large white-tail buck with record-setting antlers that trophy hunters value. Like the cattle rustlers of yore, deer smugglers are outlaws to much of the deer-hunting fraternity. "You can't defend those actions," says Gary Joyner, a spokesman for the Texas Wildlife Association, a group of landowners dedicated to "legal, fair chase hunting" and "stewardship of the land." In Texas the white-tail deer are something of a canary in a coal mine  and a good habitat for the deer is also conducive to songbirds and other native species, says Tom Harvey, a spokesman for the Texas Parks and Wildlife Department, which monitors populations and places regional bag limits on the number and age of the deer taken in an attempt to keep native herds flourishing. Deer-hunting is a birthright in much of the nation and certainly in Texas, where the state's deer are regarded as a bequest from Mother Nature to be harvested, not depleted. "White-tail deer are a natural resource that is open to to everyone in Texas," Williford says. Texas law also prohibits taking wild deer and selling them to deer breeders  game wardens arrested six Texas men on that charge in December. But bans against the sale of white-tail venison and the capture of wild deer have not deterred smugglers and rustlers eager to grab a piece of the high-dollar industry, echoing a time in the West when a man's wealth was measured in cattle. See pictures of 10 animals facing extinction. See pictures of Madagascar's remarkable flora and fauna. See pictures of the week.